The UN human rights committee passed a resolution on Wednesday calling on the Security Council to refer high-ranking North Korean officials to the International Criminal Court. The decision is expected to increase international pressure on Pyongyang to address its dire human rights situation. The non-binding recommendation, which was proposed by 60 countries including the EU, was passed 111 in favor and 19 against with 55 abstentions and is expected to be passed by the UN General Assembly next month. The next step is the Security Council, which will consider whether to refer North Korean leader Kim Jong-un and other officials to the ICC and subject them to UN-led sanctions. But since the North's long-time allies China and Russia have a veto in the Security Council, the process will probably stop there. 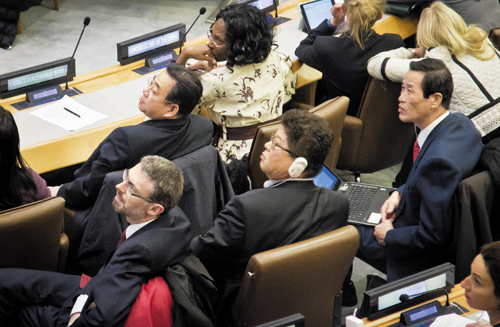 Still, the latest resolution is the most forceful criticism yet of North Korea's human rights abuses. South Korean Ambassador to the UN Oh Joon hailed it as "historic" since it has created the legal basis to single out those in the North responsible for human rights abuses. Choe Myong-nam, a North Korean official in charge of UN affairs and human rights, denounced the resolution as being "full of groundless criticisms" and added the usual warning of "serious consequences" if it is passed. Choe added the move leaves North Korea no choice but to continue with its nuclear weapons program.